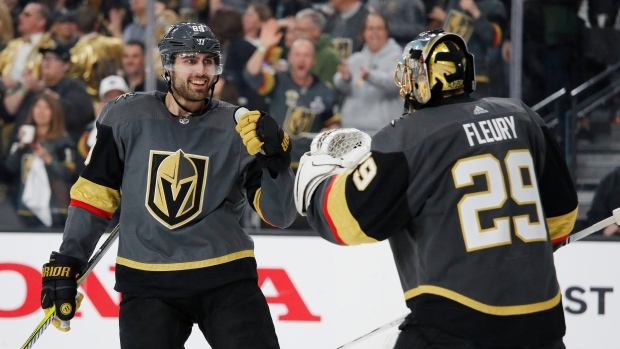 LAS VEGAS — Marc-Andre Fleury said his toughest task in the playoffs is simply finding the puck against a heavy-shooting team like the San Jose Sharks. NOTES: The Golden Knights are the first team in NHL history to score in the opening 90 seconds of four consecutive post-season periods. ... Tuch's goal marked the 13th time San Jose defenceman Erik Karlsson was on the ice when the Golden Knights scored. ... The Sharks were without injured centre Michael Haley and defenceman Marc-Edouard Vlasic. San Jose centre Joe Thornton served a one-game suspension for an illegal hit on Vegas left wing Tomas Nosek in Game 3. ... Stone became the eighth player in the last 30 seasons to have 10 or more points in his team's first four games of a post-season.